In a follow up to an article I wrote last year on the best blogs on the internet, I took some extra time to explore deeper and find even better blogs to suggest to you. I called in reinforcements this time and surveyed my colleagues, who are all well versed on internet exploration. Success is different to everyone, so some of these blogs have great content, others have a massive number of subscribers and some are just fun and the right niche. 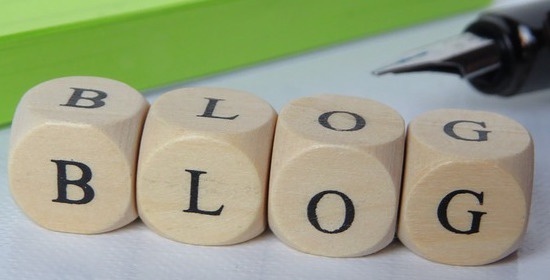 In the choices below, we will look at the full spectrum of successful blogs, so here we go! Whether you are an avid weekend warrior that gets your fly line wet daily, or an "after work, once a year" bass fisherman, this blog is a very fun read, every single post. Aimed at the sport of fly fishing, it doesn't matter whether you are thinking of just starting, or have been fly fishing since birth, people of all skill levels can find some necessary tips and guidance to getting you on the water. And that's what helps make Postfly so successful in reaching a broad audience. Every post you land on, there is clear audience engangement; people asking questions or giving shout out of thanks. 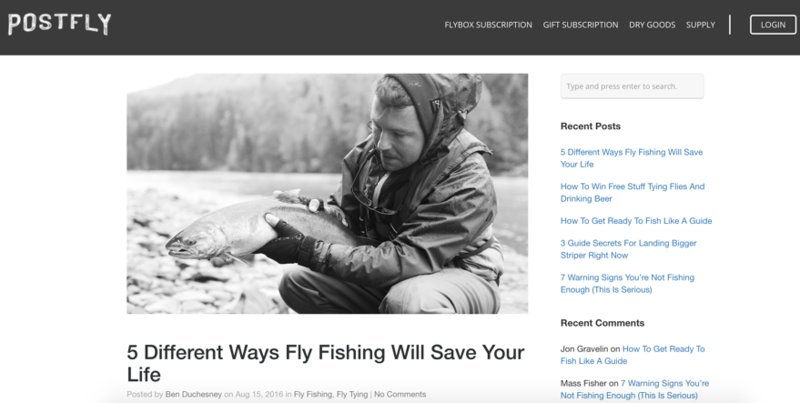 Postfly even mixes in video posts that advise people in categories like "tying your own flies" or "learning to tie knots". Now, what is even more evident from some of these comments, is that it is helping business. Postfly is like the early day Netflix for fly fishing, or Dollar Shave Club, a subscription based product that sends customers a "box" of goodies every month. What we see in the audience response is that these simplistic "Top 5" or "Best Tips" type posts are wrangling in customers from all levels of fly fishing. These posts are leading to subscriptions, and with such a simple concept, you can look at these blog posts as a "bottom of the funnel" lead conversion area. The more articles Postfly posts, the more subscribers they seemingly gather. Postfly, easily has one of the best blogs on the internet. If you are a soccer (football, futbol, etc/whatever...) fan, then you PROBABLY have "your team." Getting more granular, if you are a fan of Liverpool FC, then This Is Anfield is a must. Finding a "team" blog that is updated with the most up to date informatio and news regarding your team can be easy to find, but there are also several blogs that follow that same team. This Is Anfield, and similar sports team based periodical style blogs aren't necessarily in the "let's make money" game (some of them have a store type aspect), rather they are in the "let's give our fans the most up-to-date information" game. This Is Anfield does just that, in a clean style and easy to digest format. 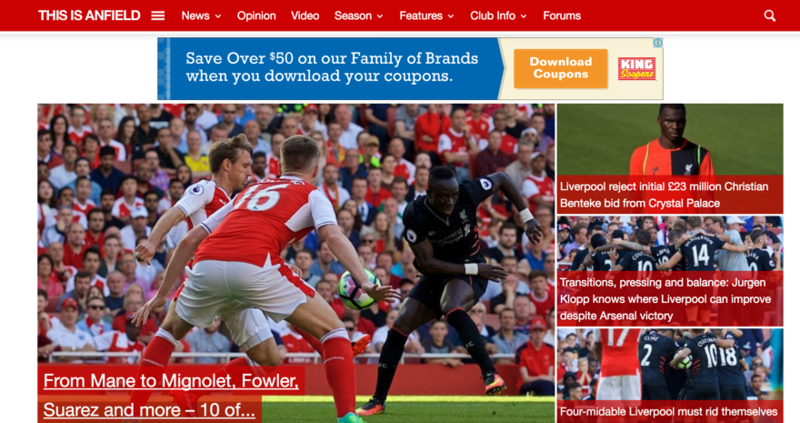 This Is Anfield is updated multiple times, daily, even during the offseason. You don't need to go a day without feeling like you are a part of Liverpool's front office. Where This Is Anfield rushes past the competition is with their integrated social media posting, gathering a ton of site traffic and "reads" from social media. On top of that, they utilize Facebook Notes so people can easily read from any mobile device, all while allowing their articles to load that much faster. 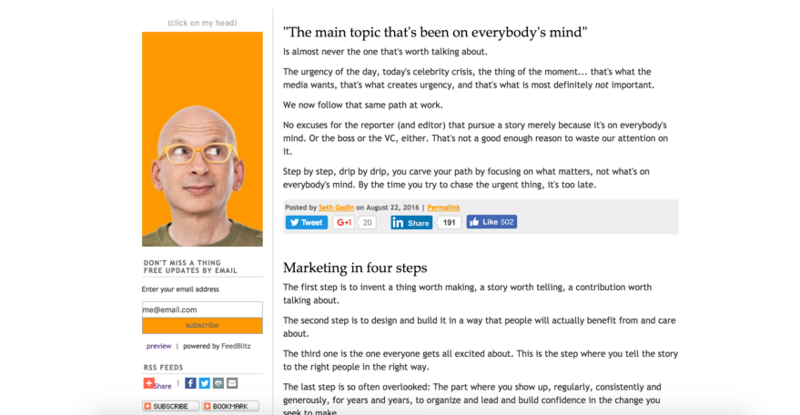 Here is an excerpt from Casey's Four Companies That Know How To Blog article: "The Microsoft Stories blog is truly a beautiful experience to interact with. At a minimum, each of their blogs are bursting with vivid photography or graphic designs that are tailored to each individual blog. Each “Story” details a certain part of the Microsoft world; the humans that work there, their part in the advancement of technology, and the science behind the digital characters inside their video games. It is easy to see that a lot of time and careful thought is put into crafting each post to maximize the viewers reading enjoyment. As a bonus, many of the posts also have animated pictures that are delightful to watch." Microsoft, as we know, is well established. Competing with the likes of Apple, the two goliaths can go toe-to-toe in their software product war, but Microsoft has taken it's blog Microsoft Stories to a new level of visual stimulation and breakthrough content. With posts giving people articles such as "sneak peaks inside one of Microsoft's futuristic labs" or how "Microsoft is opening programs to hire people with Autism", they are successful in capturing the attention of the curious and the minds of professionals. Ah yes, another soccer/grass "put the ball in the net" blog! Aren't my colleagues the best?? But, One Hour Behind has one glaring difference, in that it is updated with content directly from one of the more premier athletes in the sport, Juan Mata. Mata plays for english powerhouse, Manchester United, and seemingly, he is becoming more than just a star athelete, but a star blogger as well. Personally, I hold a huge soft spot for blogs written by athletes. For everyone who had the dream to play the sport they excelled at professionally, than I am sure you feel the same way. Juan Mata fills his blog with updates on his performance, his teams performance in previous matches, training techniques like "how to take a proper corner kick", etc...It's not just a blog focusing on himself, it goes well past that. The success of athletes goes well beyond their fame, performance, and money when they begin to build their personal brand. This is exactly what Juan Mata does here. Think about your favorite athlete, or someone you feel you look up to. Now, don't you wish you could get weekly updates on their thoughts, opinions, and a poutpori of their life? Well, if Juan Mata is your subject, then you are lucky, because he does just this. This blog succeeds in not only giving you true personal reflection and content from Mata himself, but the site is extremely responsive and clean, which is why it can be considered one of the best blogs on the internet. Nothing pains me more than seeing a blog filled with words...I realize that may be counterintuitive, but understand the thoughts behind someone who works with blogs for a living. Responsive digital media is something to strive for, and when we see it live and working in the way that One Hour Behind does, the success speaks for itself in visuals and effects. Welp...I can now say I have seen the world of "betches.com"...what a time to be alive! Betches has the description of "Brutally honest news, gossip, & advice for young women", and they aren't lying! As a tiny wordpress blog that started in 2011, we are now looking at a major brand that speaks to a large audience of females (and now a male!). From show recaps for The Bachelor to their major column, "The Betch List", Betches utilizes a novelty style approach with edgy language that anyone can get behind. One of the easiest ways to gain attention and a growing fan base is by first grabbing their attention. You can say that Betches does this with a modernistic approach. I've been reading the book Captivology by Ben Parr, and he talks about the different ways to capture the attention of the masses. One correlation, that I somewhat mention above, is the use of novelty style titles and context. Betches excels at using novelty context with words like "totes and a bunch of swear words". Parr talks about the use of these contextual words as being the catalyst behind catching a larger audience. These words are the engine behind why Betches has such a large subscriber base, and helps make it one of the more successful blog sites on the internet. If you haven't read The Purple Cow by Seth Godin, I suggest you stop reading this, and pick up a copy immediately. 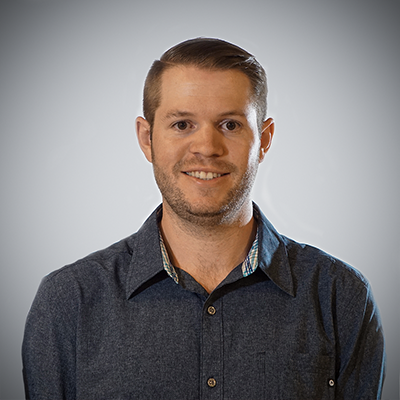 On top of being a major influence in the digital marketing industry, Seth adds to his building audience by releasing timely and pertinent articles that anyone and everyone can find something to help them boost their marketing effectiveness today. Seth's Blog is simple, there is nothing too flashy or too much glitter added in, but you can consider that tactic one of the most effective ways to reach a bigger audience. By keeping things simple, your audience has a better chance at cutting through the clutter and getting right to the bigger points of your articles. You don't need to "beef up" or add "fluff", just worry about what your message is, and what you are trying to deliver to the people that may end up reading your blog. By doing this, you can expect your message to be heard, and your voice to remain poised throughout every article you are trying to deliver. There are so many ways you can measure success, and that is evident with all of the examples of some of the best blogs on the internet above. Remember, it's not always about trying to reach everybody, start off with a couple of tiny goals for your blog. Whether you decide on building your brand audience, or building reader interaction, everything can be achieved if you can stick to your goals. Revenue River can certainly help in your blogging endeavors...hint hint, get in touch!